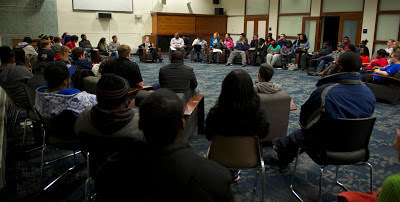 Thanks a million to all the UIS students who kept the Chancellor up way past her bedtime last night! We've had chocolate, chili with the Chancellor, chimichangas and now … Cheesecake with the Chancellor; but its not so much the food that matters. About 75 students took the time last night to sit down with me and have a great conversation about our university and about the student experience here. Every time we have one of these events I am so impressed with the intelligence, activism and leadership of UIS students. The input you all provide helps to guide campus decisions in both big things and small things. Thanks especially to all the leaders of student organizations like Student Government, the International Student Organization, OLAS and the Black Student Union who encouraged their members to attend. Now let's all go to the basketball games in TRAC tonight!